so Gandalf and the black knight had a kid? Oh lawd, it's Gandalf; "YOU!! SHALL NOT!! PAAAASS!!!" 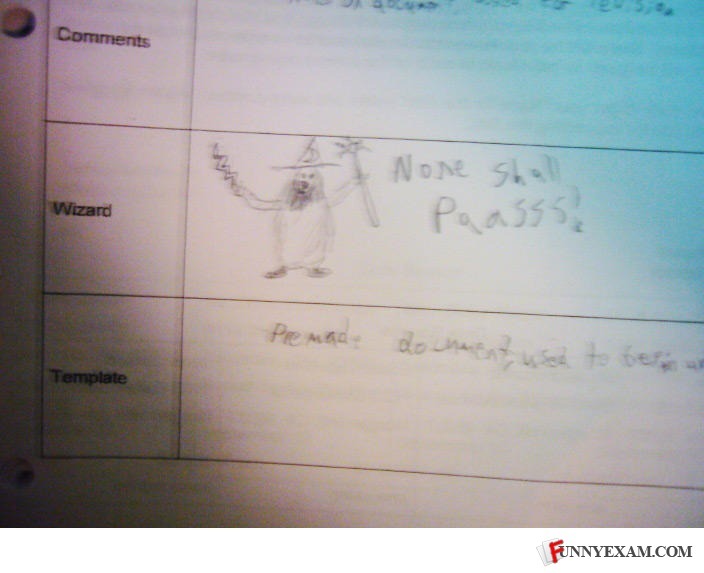 It should have been "You shall not pass!" None shall pass is what's said by guard statues. Took me a while to get! Captcha "buttock ingly"
Should have put, "Some call me...tim?". Fail! That's the wrong character! Sadly, none passed that test. He mixed up the quotes. That's what the black knight says in Monty python and the holy grail. n00b. It's the math circus wizard, you doofs! lol I always thought 'Wizard' was a stupid name for it anyway. he is not a vampire bleigh! Obviously a kids word.I mean, u can see by the writing.So these were probably notes...if not, its not a test. There is missing a finger!! the top comment isnt even funny but thumbs up if you like 420!! Why did the girl not get her mum a christmas present?